Stroll down the produce aisle and breathe in the scents of food cures. They are all around you and are the vast number of reasons why the best health advice is to eat more fresh vegetables and fruits. A new study offers a fresh look at a couple of berries that could keep the mind sharp into retirement age. 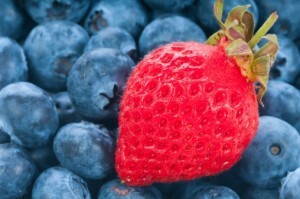 Blueberries and strawberries are high in flavonoids, natural chemicals that exert powerful effects in our bodies. Researchers found that the berries reduce cognitive decline in older adults. The results suggest that cognitive aging could be delayed by up to 2.5 years in elderly people who consume greater amounts of the flavonoid-rich berries. RECOMMENDED: How blueberries lower cholesterol. Keep your brain sharp longer! Flavonoids have antioxidant and anti-inflammatory properties. Experts believe that stress and inflammation contribute to cognitive impairment and that increasing consumption of flavonoids could mitigate such effects. Past studies that looked at flavonoids (particularly anthocyanidins) have shown that eating more foods rich in them could improve cognitive function. The percentage of adults over 65 increased by 15% between 2000 and 2010. That is a faster rise than the U.S. population itself (9.7%). As our collective age rises, cognitive decline becomes a bigger and bigger subject. To see if berries could hold a health secret, researchers turned to the huge “Nurses’ Health Study” for statistics. In more than 120,000 women, increased consumption of blueberries and strawberries appeared to slow cognitive decline in older women. The more anthocyanidins and total flavonoids, the greater the protection. Women who had higher berry intake delayed cognitive aging by up to 2.5 years. The authors caution that, while they did control for other health factors in the modeling, they cannot rule out the possibility that the preserved cognition in those who eat more berries may be also influenced by other lifestyle choices, such as exercising more. Those who eat healthier, of course, tend to live healthier. What this provides, though, is the first epidemiologic evidence (looking at a large population) that berries may slow progression of cognitive decline in older adults. It is very significant, as increasing berry intake is a pretty simple step to take — and a delicious one at that. The family of berries is one of the most nutrient-rich foods on the planet. If you want to talk about getting bang for your buck, these pint-sized fruits are splendidly nutritious. But they go well beyond getting you your essential vitamins and minerals; they are well-proven to help prevent a host of disease. That would seem to include the onset of dementia as well.